The Crossover Universe: Crossover Cover: King Crime! In this Dan Fowler story by D.L. Champion, Fowler cracks a case that begins in Newkirk City. 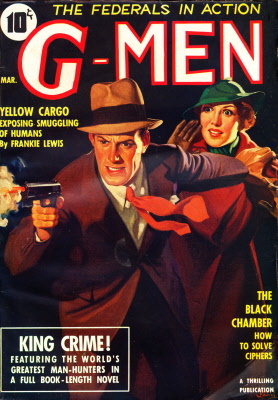 Newkirk City was also the setting of “Alias Mr. Death,” a novel by Champion serialized in nine chapters in Thrilling Detective in February–October 1932. Two more Mr. Death stories by George Fielding Eliot appeared in 1939. Since Dan Fowler is in the CU, so is Mr. Death, aka James Quincy Gilmore, Jr., who took on the guise to battle the Murder Club responsible for his father’s death. Newkirk City? I always wonder about fictional cities in the CU. Does Newkirk exist independently or is it an alias for say New York or Newark? What about say Gotham? The Mr. Death stories sound interesting. I just read about them online. I seem to remember, back when those DC/Marvel crossover comics were a thing, that it was decided that the DC Universe version of Earth was larger than Marvel's (or ours) due to it having to have room for all their fictional places which exist alongside the more familiar ones. Yeah, I remember that. I always wondered if there was something similar going on in the CU. I also wonder if I people from the real world exist in the CU? I mean sure it probably has the same President, but, for example, do I exist in the CU?